Each May OWAC hosts a reception to mark the end of its program year and give members and guests the opportunity to meet and socialize in a festive atmosphere. 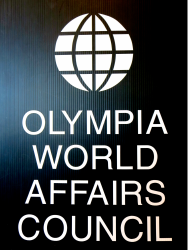 It’s also the occasion for the presentation of the Global Connect Award, which recognizes an individual or organization for their contribution to connecting our Olympia area to the wider world. For the first time since we created the Global Connect Award in 2013, we are giving it to an organization: Friendly Water for the World. An Olympia-based group, Friendly Water is doing terrific work in Africa, Asia and Latin America training communities to use locally-available, affordable materials to build water filtration devices for home, school and village use. The devices are having dramatically beneficial health effects, as well as empowering the people who create and use them. The reception will be 6:00 - 8:00 PM on Wednesday May 17th at the Indian Summer Golf and Country Club, 5900 Troon Lane SE, Olympia, WA 98501. The event is open to members and their guests, tickets are $30.00 per person. Click to visit Friendly Water for the World on the web.